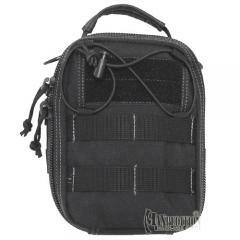 The Maxpedition FR-1 Medical Pouch is a tough, well-organized carrier for first aid supplies or other equipment. Its zippered clamshell design comes with a paracord adjuster that allows you to set its opening angle. Inside, layered pockets provide organized space for your gear. It also contains elastic loops for secure retention, and features a TorchLair system in the front for carrying a flashlight. A sturdy carry handle on the top makes it easy to carry, and it comes with two D-rings for attaching an optional shoulder strap. The bag is made from durable 1000 denier ballistic nylon, with reinforced stitching for enhanced wear resistance. Its triple polyurethane coating and taped internal seams keep out water, and a built-in drain grommet allows liquids to escape.